I wanted a shoe that somewhat looked like my Chuck T's because I started noticing everyone jumping on the Chuck T bandwagon. At first they were just an acceptable replacement, but now I think they look better with most jeans and shorts than the Chuck T's. I can wear them with socks or without socks and be comfortable. That being said, the worst part was the break-in period, which lasted over a month. The upper heel support is leather or synthetic leather, either way it is REALLY tacky. This ate away at my heel for quite awhile. I like to wear no-show socks and those were not high enough to stop the back of my ankle from getting chewed up. I started walking on the backs to make it loosen up a bit. I even contemplated putting some sort of fabric tape back there, or cutting out the leather part. 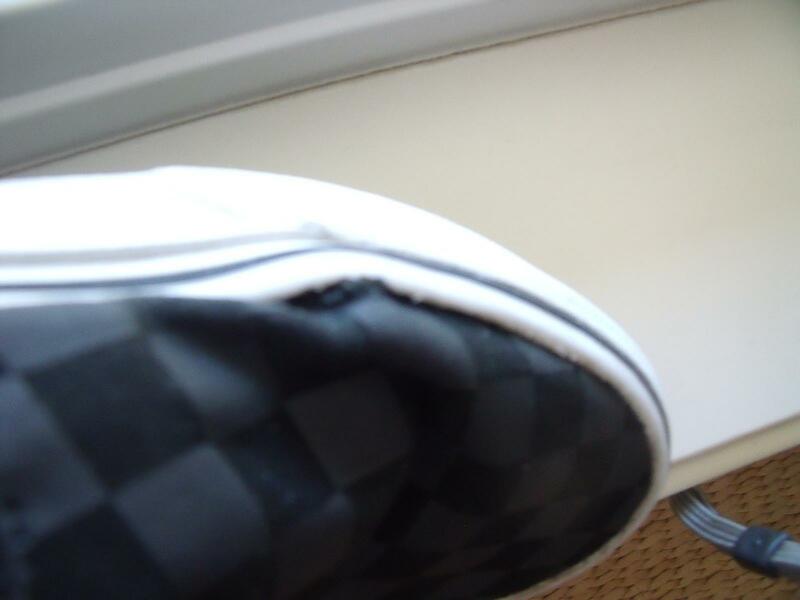 But I toughed it out, and after about 1.5 months it eventually stopped being so tacky and now the shoe is perfect. 28 found this review helpful. These are the shoes I have been searching for my entire life. Little did I know they were right under my nose. I`d always seen them and passed them up. The older I get, the lazier I get. No laces?! Sign me up! These are comfy. I have slightly wide feet and these really fit the bill in terms of not being too squished for my poor little feet. They are cute, go with everything, and are great every day shoe. No complaints thus far. I will continue to repurchase when these die. 16 found this review helpful. Herk Engineer. 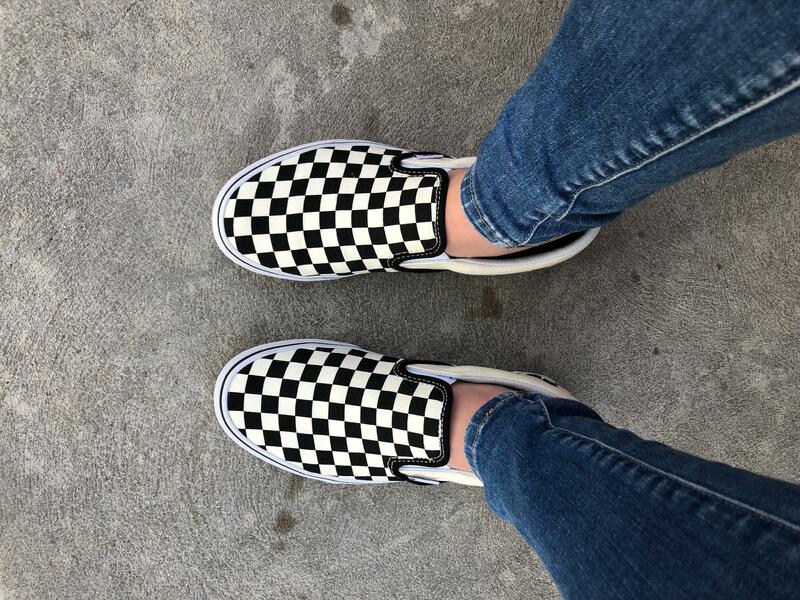 I got my first pair of checkerboard Vans in the late 1970's when I was in high school in Southern California, (Artesia High). They were cool then and they're still cool today. Since then I've been flying for the Air Force for 16 years here in Arkansas. I got a pair for Christmas last year and I was surprised they still existed. 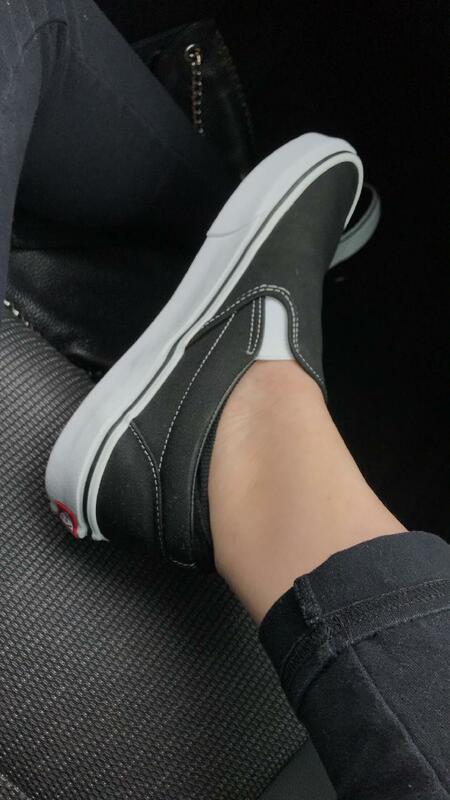 I'm 41 now and I get so many compliments when I,m sporting my Vans. Everyones body grows older, but you're spirit doesn't have to,(I still skate the half pipe). For style, comfort, fit, and especially personality, you can't beat the "Classic Slip-On. You'd have to ask my wife, she buys all my other shoes. 14 found this review helpful. Love these. I was getting kind of bored/annoyed with my Converse lately (the tongue is all wrinkly), so when my friend got these in white and I tried them on I was inspired. I got these in black and white and they are really cute! At first I worried that they might be stiff for a while but after slipping them on and off to try them on about 5 times and wearing them for 1 school day, they've loosened up and fit perfectly! They make my feet look smaller than they are (yay) which I like about Vans, because Converse tend to do the opposite. Zappos service was great as usual. One thing, though -- these seem to run large, and I typically wear a women's 7 and my friend's 6 fit me. I ended up getting a 6.5, however, and they are perfect, so go a half-size down than your usual size. Thanks Zappos! 8 found this review helpful. I love them! They are so comfortable and stylish! 6 found this review helpful. 5 found this review helpful. Excellent and very comfortable all around casual shoe that feels great and doesn't need to be broken in. Love vans so I just love the shoes!!! 4 found this review helpful. Not a cushy shock absorbing running shoe but a basic canvas and rubber sneaker. I got these to keep me from bare footing around the house and yard. They're great for that. Quick to step into and kick off. When I get 'em scummy from yard work and car washing I toss 'em in the washer and sit 'em out to dry. I wore them out to dinner when I first got 'em but then put 'em to work. I'm gonna get another pair so I've always got a dry pair on hand. And of course Zappos is great to deal with. I'm 60 yrs young and get a bit younger every time I slip into my vans. They were great decades ago and continue to be. When the purchase is coupled with Zappos great service... oh my! It's definitely "OFF THE WALL". Wear these if you're pregnant! My mother-in-law took me shopping for new shoes that I wouldn't have to tie, being eight months pregnant. 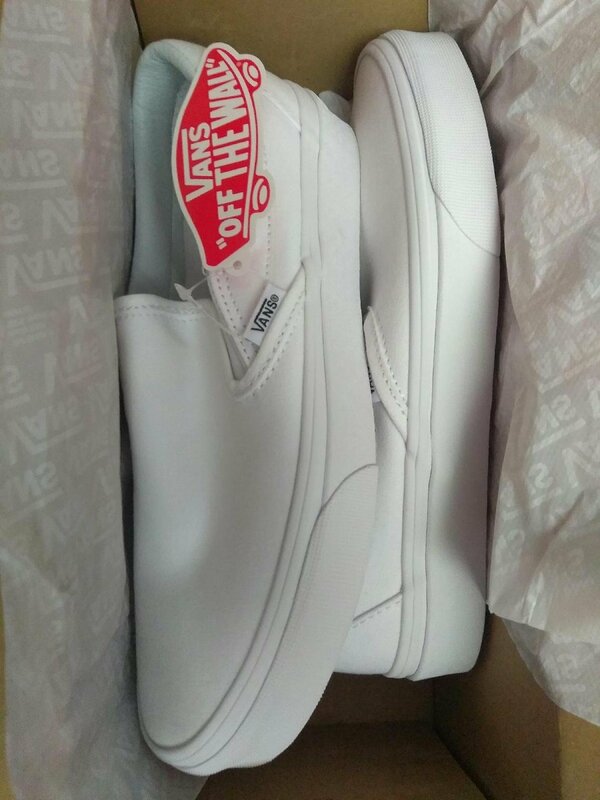 I immediately dragged her to the nearest Vans store and bought some new slip-on's to replace my shot-out Spicoli's. I wear nothing else. If you get pregnant, stock up on all colors of this classic. When your feet swell, you'll be glad you did! I've bought these for my ten year old son for three years now. He loves how comfortable they are over the top of his foot because there are no laces to press down on it. What I have noticed that is not good about them is they tend to separate from the sides of the sole where the foot bends. Maybe this is because my son wears them a lot and is hard on shoes. The style we chose was the black checkerboard and it always looks good with shorts or jeans. Son says he likes the arch support, but honestly, there's not much there. I absolutely love these shoes! They're true to the size and very comfortable. I feel like they're a staple that everyone needs in their wardrobe. Since they're white they match with almost everything. The shipping was SUPER fast. Overall a great product! 3 found this review helpful. Shoes are awesome! Exactly what I wanted. Got here within a day! Couldn't ask for better place to go for shoes! After a hard day at work, I want to stay at home. But, turns out, I have to leave. This slip on shoe is awesome. It lets me ollie the kids. the DVS staffford is AWESOME. Great shoes to keep my feet cool. I can wear these in Spring, Summer and Fall just by changing from thin socks to thick socks. The grey color goes with almost any pants. Great, comfortable shoe. Seems sturdy enough though I've not had them long. Would recommend breaking them in before wearing for extended periods/long walks (but that's typical of any new shoe). I'm surprised so many people marked this as true to size--I had to return my normal size (10) for a 9.5. First of all, I got the black ones, but they look lighter than they actually are in real life due to the picture’s lighting. Other than that, they’re really black and look exactly like the pictures provided on here. I wore these shoes for the first time today since I bought them and they’re extremely cute! However, just a little heads up for first time buyers, these shoes do run pretty narrow; so if you have wide feet (like me), it’ll be a little bit difficult to put them on at first, but you should be fine once you break them in! That seems to be the case for me most of the time. Size-wise, I had no issues because these do run true to size. Other than that, I love these classic slip-ons and they’re my go-to shoes. Also, really great quality and super fast shipping and delivery since I purchased them using the app! They were shipped the same day I purchased them (I purchased them around 6am) and they were delivered the next day! Overall, I had a great experience with Zappos and I’m very happy with my purchase. 2 found this review helpful. 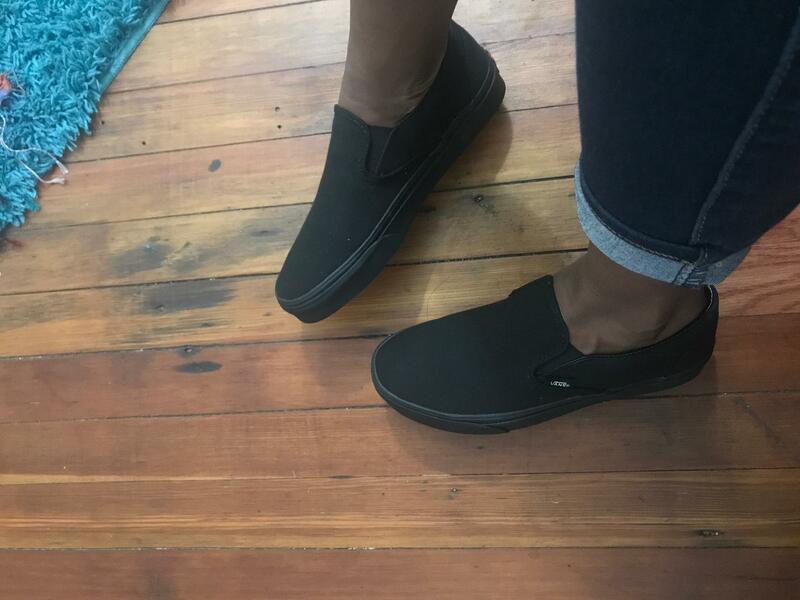 This is probably my 6th pair of Vans Slip-Ons and therefore it is obvious they are one of my priority shoes for all around comfort and wear to work and any place with casual dress. I give them a 5 stars and i give Zappos 10 stars for customer service when I order and whenever I have questions. Everyone has always been super efficient and super friendly and that makes my shopping a pleasant experience every time I call. I live in a remote area and they have never failed with overnight delivery. Zappos is super. Vans are a classic! I have a few pairs and I always know I can trust their fit and look. 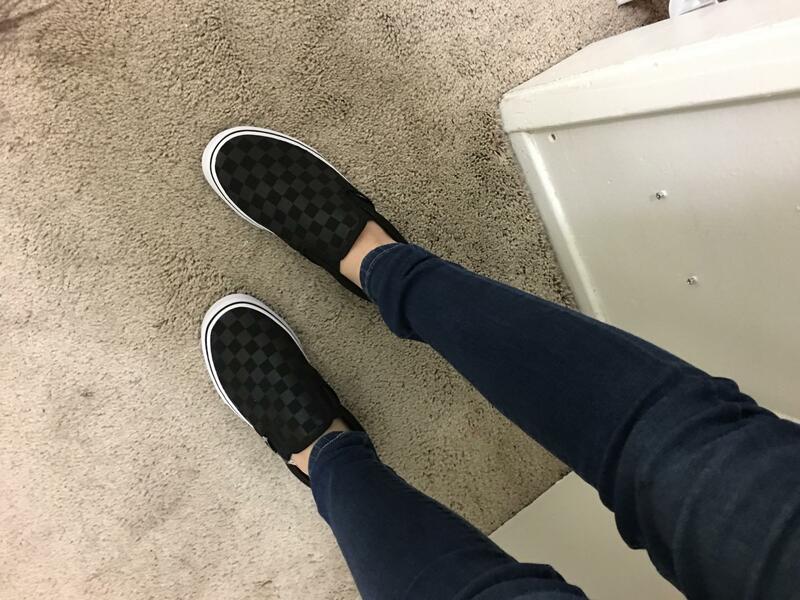 Got lots of compliments on my new Vans! The size is true! They got here super fast! And this is the best price around. You can't beat Zappos. They are the best! My old one was starting to develop a crack on the side rubber and small hole on top at a criss where it bends. Ordered a smaller size but it didn't fit so I returned and got the correct size with no hassle. Zappos works for me! There's a reason this is a classic. Actually, there are several reasons: cool, comfortable, goes with everything, and it's cheap! Um, hello! I ordered these shoes one day and literally received them the next. Incredible! As always, Zappos delivers great service and awesome shoes! I love Zappos' customer service, fast shipment. They are definitely my go to when I need shoes in a hurry. They have great prices too.